Gwido Zlatkes, Paweł Sowiński, and Ann M. Frenkel, eds. 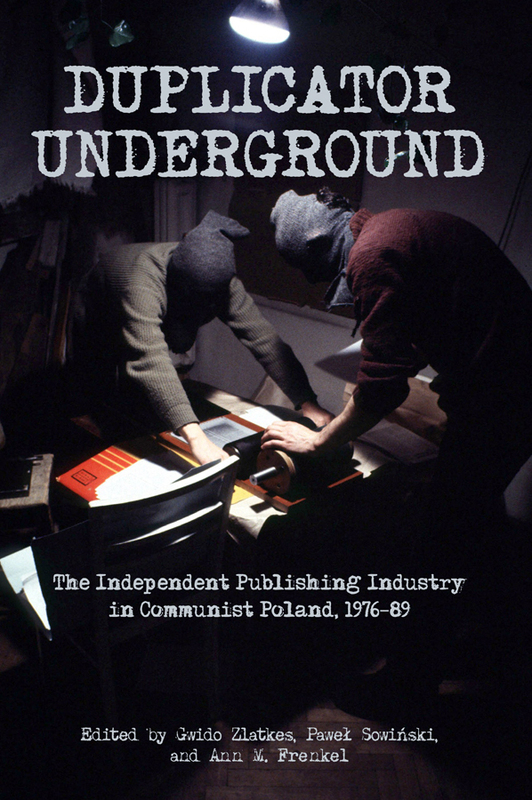 Duplicator Underground is the first comprehensive in-depth English-language discussion of Polish independent publishing in the 1970s and 1980s. This anthology provides wide-ranging analyses of uncensored publishing and printing in communist Poland between 1976 and 1989. It gives a broad overview, historical explanation, and assessment of the phenomenon of the Polish “second circulation,” including discussions of various aspects of underground printing, distribution, and circulation of independent publications. The documentary part of the book is comprised of contemporary narratives and testimonies of the participants, including editors, printers, and distributors of underground literature. The book argues that rather than being a form of samizdat, Polish underground printing reached a semi-industrial scale and was at the same time a significant social movement.